TPG contributor Jason Steele returns this Friday to talk maximizing Starwood Preferred Guest promotions, just in time before the limited time 30,000 point offer on the personal and business Amex cards ends on June 30, 2104. According to TPG’s most recent monthly valuations, Starwood points continue to be the single most valuable point or mile offered. Certainly, a huge part of this value is based on their many airline transfer partners and the 5,000 point bonus that you receive when transferring 20,000 points at once. Reasonable award chart for mid-range hotels. Award nights start at just 2,000 points per night for a Category 1 property (though there aren’t many of those). Hotels in Categories 2-4 are easy to find, and cost just 4,000, 7,000, and 10,000 points per night, respectively. 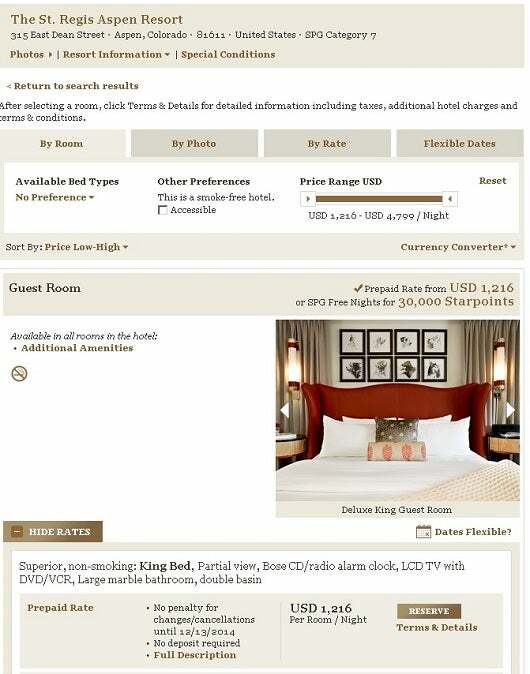 Competing hotel chains often price award nights at similar properties much higher. Fifth night free. When you book four consecutive award nights, Starwood lets you stay the fifth night for free. This can increase the value of your points by 25%. No blackout dates or capacity controls on standard room awards. Unlike most airline awards, Starwood will let you redeem your points for any available standard room. That said, some hotels maintain a large quantity of rooms that they label “superior” in order to circumvent this rule. Few taxes and fees. Booking an international award flight can involve hundreds of dollars of taxes and fees, and even more expensive fuel surcharges. On the other hand, governments typically impose hotel taxes based on the rate paid, so an award night is often truly free. With Starwood, the exceptions include properties classified as “resorts”, which add a resort fee to award bookings, as well as any location where an occupancy tax is collected based on the number of persons in a room. 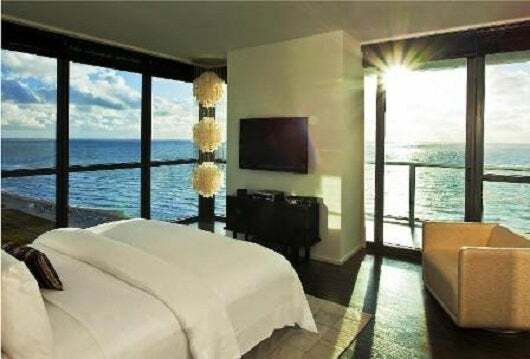 A room at the W South Beach in Miami can cost $1,479 a night (with taxes and fees), or 35,000 points. How much value can you realize from Starwood free night awards? To try to quantify the value of Starpoints used for free night awards, I researched five different properties within each of Starwood’s seven redemption categories, and compared the points needed to the range of prices at each property. The prices used are the lowest non-refundable rates, and I made sure to include taxes and fees that would not be paid if using an award night. On the other hand, I didn’t add “resort fees” that are still paid by those on award stays. Before doing this research, it had been my experience that the best hotel award values in the Starwood program were actually at the low end of their categories. There aren’t too many “bad” properties among the Starwood brands, and 2,000 – 4,000 points per night can return a lot of value per point redeemed. 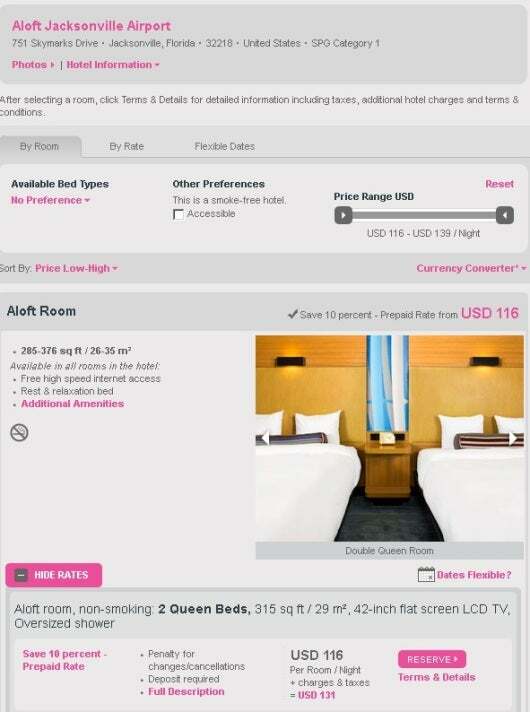 A room at the Aloft Jacksonville Florida airport can cost $133 (with taxes and fees), or just 3,000 points. This seemed largely true for Category 1 and 2 hotels. I saw value as high as seven cents per point at the Le Méridien Dahab Resort in Egypt for a weeknight stay over the winter holiday season at only 2,000 points a night. In fact, I was almost always able to do better than 2 cents per Starwood point booking category 1 and 2 hotels, which is the break even point where you’re better off using either the Barclaycard Arrival Plus or Capital One Venture Rewars Credit Card card. In Categories 3 and 4, which represent the bulk of Starwood’s properties, the results were mixed. It wasn’t too hard to find 2-3 cents in value per point, but there were plenty of instances where rooms were heavily discounted during off-peak times, yet the number of points required stayed the same. In those cases you’re likely to see just 1 or 2 cents in value per point redeemed, and those who closely guard their Starpoints might decide to pay cash instead and earn more of them. On the other hand, some properties like the Westin in downtown Denver returned a phenomenal 5.22 cents in value per point redeemed. For example, I found a mid-week stay in September that was going for $522 per night or just 10,000 Starpoints. A room at the Westin in downtown Denver can sell for $552 per night with taxes and fees, or just 10,000 points. Category 5 was also a letdown, since many of those properties have higher, “Peak Season” rates that often failed to correspond with the room rates I looked at. The standard rate is 12,000 Starpoints, but the Peak Season rate is 33% higher at 16,000 Starpoints. Furthermore, many of these properties impose resort fees, which further devalues any award redemption. For instance, the Sheraton Princess Kaiulani seems to sell for between $209 and $277 per night, which works out to about 1.75 cents in value, and you still have to pay a resort fee of $26.18 per night. In Categories 6 and 7 you start to see some ultra-luxury properties, and the redemption value can be all over the map. For instance, the St. Regis in Aspen, Colorado can charge as much as $1,353 during the ski season, although it might not be a designated part of Starwood’s “Peak Season.” So if you really value that room at that price (I’ve stayed there, and it is very nice), then you’re getting 4.51 cents per point from your 30,000 Starpoints. On the other hand, a stay in mid-May (when Aspen is almost a ghost town) costs $349 or 35,000 Starpoints, returning a mere penny in value per point. A room in the St. Regis Aspen, Colorado sells for $1,353 during ski season, or 30,000 points. 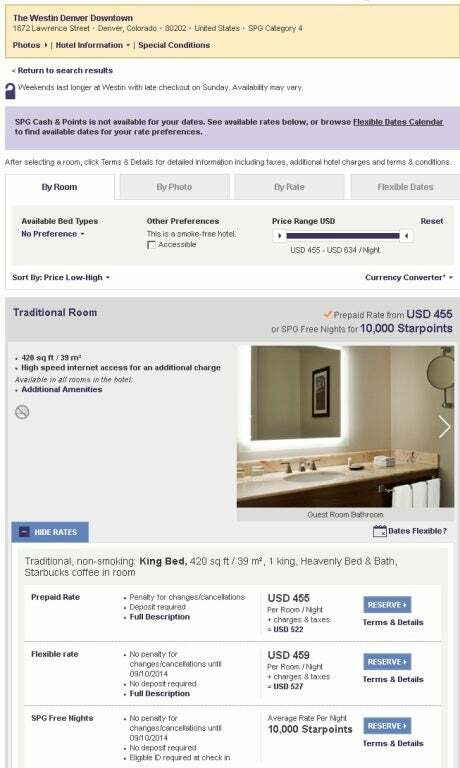 Ultimately, I found that the price in Starpoints correlates poorly with the price in dollars, which sets up both some great deals and some mediocre ones. Of the 35 hotels I sampled, I found an average value of 2.8 cents per point for room redemptions. The values you find will always depend on where and when you stay. What has been your best Starwood hotel redemption (in terms of either dollar or enjoyment value)? Please share in the comments below.